We offer a great selection of darts to choose from. To learn more visit the manufacturer websites below. 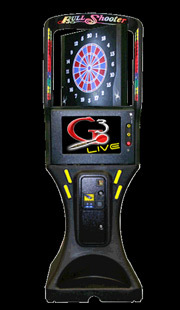 Building on Arachnid's most advanced dartboard to date, new for 2017 is the G3 Phone Charger dartboard. It sports all the exciting features from the Galaxy 3 Live, including worldwide online play, tracked player rankings and statistics, and now you can charge your phone. No more low batteries, dead phones, or hunting around the walls looking for an empty plug socket while out at your favorite dart location. Now you just plug right into one of the four illuminated pockets, select the time frame to charge your phone and your phone will recharge while you enjoy some games either in Remote or Casual Play!